The company that invented the motto “Move fast and break things” certainly managed to break things pretty good during the 2016 election, promoting Russian troll-farm fake news content to as many as 126 million Americans during the election cycle (and pocketing a paltry $100,000 in the process). Facebook now vows they’ll be much more transparent about political advertising going forward, as today they get set to testify before Congress about the Russian meddling that took place on their platform (livestream here). But as Facebook gets ready to testify, BuzzFeed News has acquired Facebook’s pitch to political advertisers during the election cycle. We see in the pitch that Facebook’s vaunted “algorithm culture” is in fact shockingly stupid and simplistic with regards to political identification, and breaks every American down into one of “14 independent segments” drawn up by the kind of tech folk who think mini cupcakes are a standard form of caloric measurement. Interestingly, the “Youthful Urbanites” demographic lists ‘Boxing’ as an interest. I’m frankly skeptical that there is currently much interest in boxing. 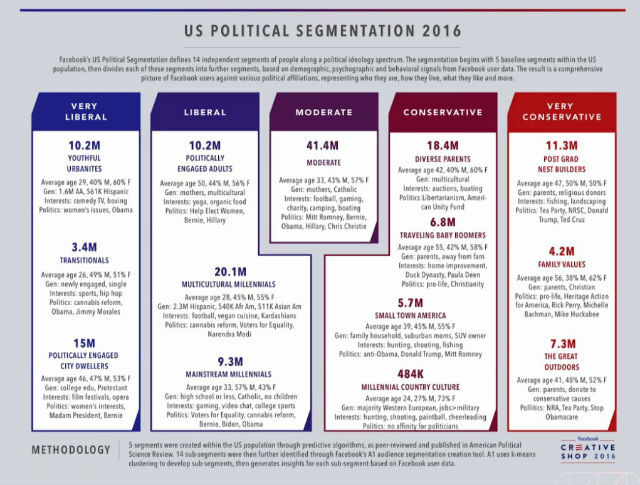 At the expense of sounding redundant, these segments do not represent all of Facebook-using America. These segments represent middle- and upper-class Caucasian Facebook-using America. It’s not unreasonable to conclude that a white bias in forming these tools makes the tools better at engaging white people, at the expense of engaging communities of color. That the tools were developed by a not particularly diverse workforce may make them more powerful at reaching white people, with a tech wealth disposition inherently baked into the (mini cup) cake. This is, of course, separate from the more granular targeting of segments like “Jew Hater” and “Nazi,” which Facebook did indeed allow until ProPublica called them on it last month. And this seems symptomatic of how Facebook is missing the point. For all its self-professed targeted demographic wizardry, Facebook doesn’t seem to have a clue how dishonest players are gaming their platform in ways that are light years beyond Facebook’s safe, namby-pamby suggested parameters. Zuckerberg and company seem stuck in a cushy Silicon Valley mindset that assigns actual reality to the milk-and-cookies stereotypes that investors and advertisers are comfortable with. The monster they’ve created is being used for far more sinister purposes than what falls within purview of the company advertising parameters. Facebook remains flat-footed and clumsy in response to troll accounts that literally call for U.S. violence, and internationally, use of Facebook to cause real-life mass violence. There is a popular Silicon Valley notion that tech execs like Mark Zuckerberg, Sheryl Sandberg, and Sergey Brin are the best and brightest minds of our era. But if their platforms are being used in ways they didn’t anticipate and still can’t control, well, doesn’t that inherently make them not best and brightest minds of our era? Image: Facebook, acquired by BuzzFeed News, click here for full size.